In a sign of the increased tensions between the United States and China on the open seas, navy vessels from the two countries almost collided in the South China Sea when a Chinese ship cut across the bow of an American cruiser, a senior United States defense official said on Saturday. A serious accident was averted when the U.S.S. Cowpens, a missile-carrying cruiser traveling in international waters, was forced to maneuver to avoid the Chinese vessel, the official said. The episode, which occurred on Dec. 5 but did not become public until Friday, was one more example of the growing rivalry between China, a rising maritime power, and the United States, the dominant naval power in the Pacific region since World War II. It came as the Obama administration has chastised China for imposing an air defense identification zone in the East China Sea over islands and airspace that are also claimed by Japan. The U.S.S. Cowpens was observing the new Chinese aircraft carrier, the Liaoning, as it made its first voyage in the South China Sea from its home base in Qingdao, the headquarters of China’s North Sea Fleet, the defense official and American Navy experts said. The official and Navy experts spoke on the condition of anonymity because of the sensitivity of the matter. The Chinese vessel cut across the bow of the America ship at a distance of less than 200 yards, the defense official said. The vessel was similar to an American tank landing ship and was accompanying the aircraft carrier, apparently as a screen. Surveillance activities by the United States of Chinese military operations have always been sensitive. In 2001, an American EP3 spy plane collided with a Chinese fighter jet in the waters off southern China, an accident that sent relations between Washington and Beijing into a freeze. Ever since, Chinese officials have complained to senior American officials about American planes’ peering into Chinese waters, saying that the practice treats China like the enemy, a senior American official said recently. The United States replies with its own complaint: that the lack of transparency by China impels America to do its own reconnaissance, the official said. The information office at the Chinese ministry of national defense did not immediately respond to a request for comment. American officials said the U.S.S. Cowpens had been adhering to international guidelines governing such naval maneuvers. The Chinese ship accompanying the aircraft carrier began shouldering the American cruiser, and then crossed its bow, he said. After making the evasive maneuver, there was “bridge-to-bridge” contact, in English, between the two ships, the official said. “It was tense but professional,” he said. It was not clear how far the U.S.S. Cowpens, a vessel more than two decades old, was sailing from the Chinese aircraft carrier. But because of the sophisticated American radar, it did not have to be particularly close in order to observe it, naval experts said. The Chinese aircraft carrier, a refurbished Ukrainian vessel, was launched last year, and is not yet fully operational. For instance, it does not carry a full complement of aircraft. Still, the United States Navy wants to understand how the Chinese are planning to use the carrier. When it left port, the carrier was accompanied by two missile destroyers and two missile frigates, Chinese new media reported. Officials from the American and Chinese navies meet every year to discuss maritime rules and incidents at sea, but so far, the gatherings have been fairly desultory, Mr. Goldstein said. “The maritime consultative agreement has been a disappointment to the American side,” he said. The fact that the episode between the U.S.S. 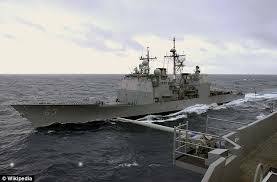 Cowpens and the Chinese ship took place in the South China Sea is bound to raise concerns, naval experts said. China contends that more than 80 percent of the sea is under its purview, and in a signal of its intention to enforce that claim, the nation has taken virtual ownership from the Philippines of the disputed Scarborough Shoal in the South China Sea. In March 2009, five Chinese ships harassed the U.S.S. Impeccable in international waters in the South China Sea, forcing the American ship to make an emergency maneuver in order to avoid a collision. I wonder if it was an accident. But then again, what the hell are yanks doing in the south China sea. Sticking theirs noses in as usual. Maybe China should have tested their advanced missile system on them. Its international waters. Lots of trading goes on in the ports of China and other countries have ships there to to make sure no internatinal maritime laws are broken.